This species was brought to my attention about two years ago by a friend who, like me, was working on completing her Master's thesis at that time. In the post-script of her message, titled 'Probably the coolest thing I've learned in weeks', she wrote "PS I swear this started out as a legitimate search for information for my thesis." 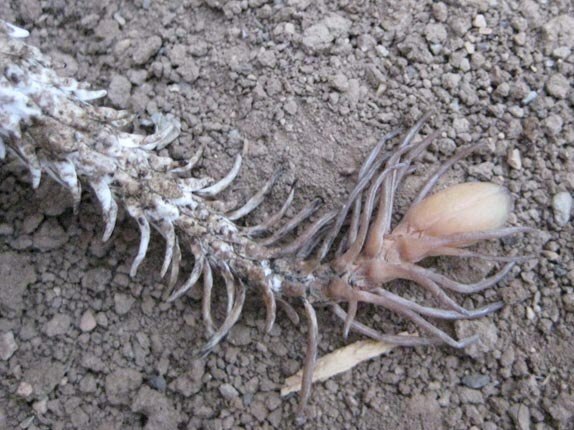 In addition to being a welcome distraction from my writing, the story of the Spider-tailed Horned Viper, Pseudocerastes urarachnoides, is, in my opinion, one of the most interesting recent discoveries in herpetology. The first specimen of P. urarachnoides was collected in 1968 by the Second Street Expedition, mounted on behalf of Chicago's Field Museum of Natural History by a retired businessman and activist couple, William and Janice Street. The primary purpose of the expedition was to collect mammal specimens, but reptiles were also collected, including the first specimen (also known as a type specimen or holotype) of P. urarachnoides. Because only a single specimen was collected, its unusual tail morphology was thought at first to be a solfugid clinging to the tail. Solfugids (also called solpugids, camel spiders, wind scorpions, or sun spiders) are members of the same arthropod class, the Arachnida, as spiders and scorpions, although they are neither spiders nor scorpions. Upon closer examination, the Field Museum's Steven Anderson found that the tail of the snake bore a peculiar structure with an uncanny resemblance to a solfugid that could have been a tumor, congenital defect, or growth caused by a parasite. The snake was identified as Pseudocerastes persicus, the Persian Horned Viper, and entered into the Field Museum collection, where it was almost, but not quite, forgotten. The story ended there, until 2001, when Hamid Bostanchi collected a second specimen with identical tail morphology to the first. 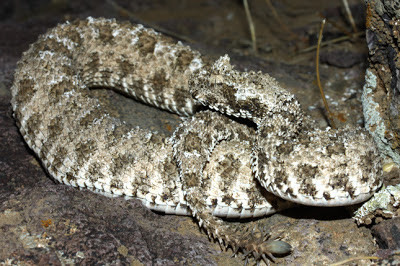 A third specimen was later discovered in the collection of the Poisonous Animal Section of the Razi Institute in Karaj, Iran, in 2008; it had been misidentified as a Desert Horned Viper, Cerastes cerastes. Together with Anderson, who had described the first specimen, and their colleagues Haji Gholi Kami of Gorgan University and Ted Papenfuss of the Berkeley Museum of Vertebrate Zoology, they described the new species in 2006, naming it Pseudocerastes urarachnoides, from the Greek ura (tail), arachno (spider) and ides (similar to). In their paper, Bostanchi et al. described the structure of the tail, which is formed of the last pair of subcaudal scales, much enlarged, and a single enlarged dorsal scale. The elongated components are modified lateral scales. X-rays taken by the team showed that the caudal vertebrae extend well into this structure and are not deformed or modified. Bostanchi et al. also speculated that the function of the modified tail might be to augment caudal luring behavior exhibited by many vipers. By mimicking a solfugid, birds or other would-be solfugid predators could be enticed to approach within the viper's striking distance. Behavioral observations made in 2008 of a live P. urarachnoides captured in western Iran and maintained in captivity confirm these ideas. 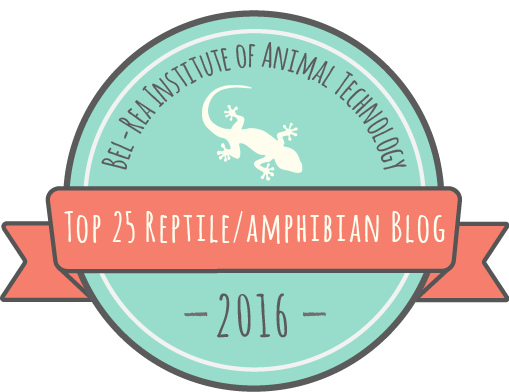 Closed-circuit video was used to record behavior, and the results published in the Russian Journal of Herpetology by Behzad Fathinia of Razi University and his colleagues. They observed the snake, a juvenile male that regurgitated a Crested Lark, using its caudal lure to attract sparrows and baby chickens that they introduced into its enclosure. When the birds approached and pecked the tail, the snake struck and envenomated the birds, a process taking less than one half second. 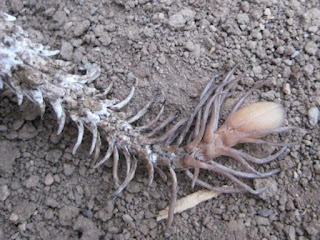 A bird was also found in the stomach of the paratype specimen, further evidence that this species might feed heavily on birds in the wild with the aid of its spectacular caudal lure. The tail of P. urarachnoides probably represents the most elaborate morphological caudal ornamentation known in any snake, with the possible exception of the sound-producing rattles of rattlesnakes. 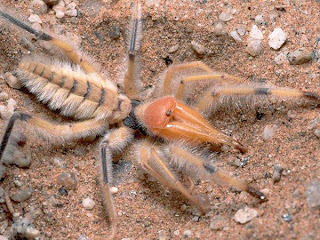 Within its restricted range in the mountainous terrain of western Iran, P. urarachnoides inhabits rock crevices in the gypsum formations that comprise its hilly, arid habitat. Adaptations of the genus Pseudocerastes to desert life include supralabials (upper lip scales) with a serrated lower margin and a groove to accommodate the lower lip, which provide complete closure of the mouth and prevent sand from entering. The nostrils also have a valvular prominence to the same effect. The other two species of Pseudocerastes, P. persicus and P. fieldi, share these characteristics. These two species are sometimes combined, although differences in venom chemistry and scalation, along with the fact that their ranges are separated by the Zagros Mountains, suggest that they are probably distinct species (and they are certainly distinct morphologically from P. urarachnoides). Both overlap in range with P. urarachnoides in places. 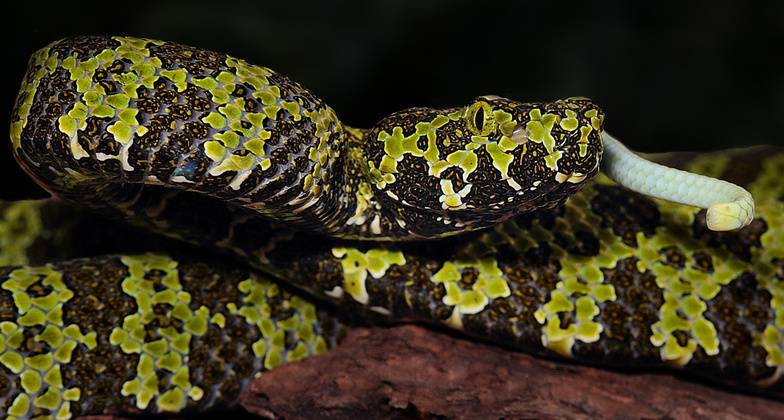 Two other recent and noteworthy discoveries of Old World pitvipers are worth a mention. 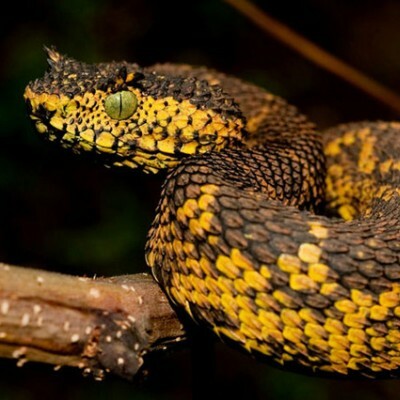 One, Protobothrops mangshanensis, is a large and beautiful pitviper discovered in 1990 in mountainous regions in southern Hunan and reputed to be the only non-cobra capable of spitting venom. The other, Atheris matildae, discovered in 2011, is a member of an especially popular genus in the pet trade (although this could be said of many of the most beautiful vipers). The exact type locality of A. matildae, in the southern highlands of Tanzania, was concealed in order to limit collection for the pet trade. In addition, a novel strategy is being tested: A. matildae is being bred at a facility in Tanzania and the first few dozen offspring are being given away to collectors in order to reduce the market for illegally collected specimens. Whether this strategy will succeed remains to be seen, but hopefully A. matildae can be saved from the same sad fate as the Lao Newt, Roti Island Snake-necked Turtle, Chinese Leopard Gecko, coelacanth, and other species that have been overcollected almost as soon as they were described. 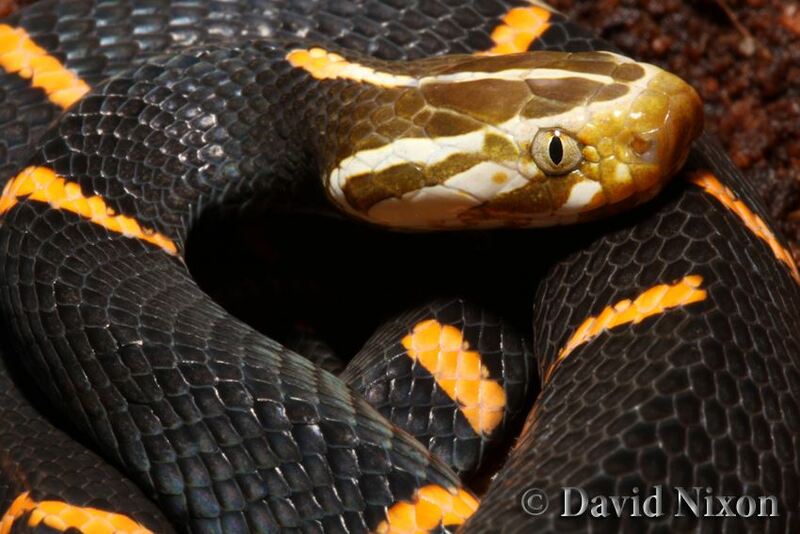 Check out another amazing new snake discovery at Greg Laden's blog: once thought to be a single deadly sea snake, Enhyrina schistosa is actually two! Update 1/16/2015: Check out this video of a P. urarachnoides actually caudal luring and catching a bird! Thanks to Heather Heinz for bringing P. urarachnoides to my attention, and to photographers and videographers Michael Kern, Behzad Fathinia, Michael & Patricia Fogden, Omid Mozaffari, and Alireza Shahrdari. 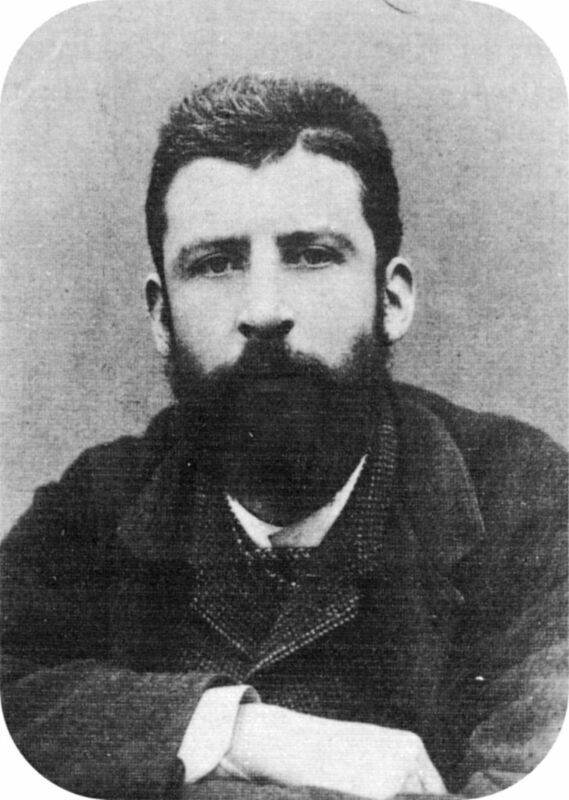 Late one spring night in 1887 in the Kakhyen Hills of Burma, 35-year-old Italian explorer Leonardo Fea crested a karst outcrop and entered a bamboo thicket. He barely noticed the rain, because before him lay a two-foot long snake of indescribable beauty. It was shiny, dark purplish-black and marked with thin, widely-spaced neon orange bands so bright they almost looked white. The head bore a striking symmetrical pattern of orange, gold, and black. When Fea picked the snake up, he saw that it had a plain purple belly. It appeared to be a harmless colubrid, and luckily for Fea, he wasn't bitten, so he had no opportunity to find out that it wasn't. Fea was among the many European explorers and natural historians who were pouring into the newly-annexed nation of Burma, whose cultural roots date back to the 2nd century BCE. He collected thousands of vertebrates there for the Genoa Civic Museum, but perhaps none so unique or amazing as that snake. When Belgian-British herpetologist George Boulenger received a loan of Fea's reptiles from the museum, he declared of the single specimen "I may well say that Azemiops is the most interesting ophiological discovery made since that of Dinodipsas [Causus]1". 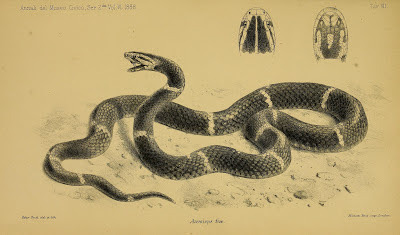 Boulenger described it as a new genus and species in his 1888 report on Fea's expedition, writing "it affords me great pleasure to connect with [this snake] the name of the courageous and highly successful explorer to whom science is indebted for this and so many other additions." 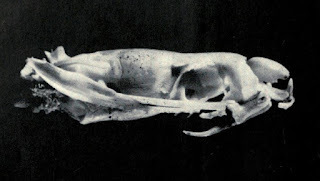 Azemiops feae was the first species named for Fea, who was soon to also receive the honors of an eponymous petrel, tree rat, and muntjac, collected with his "untiring zeal" in southeast Asia and the Cape Verde islands. and the absence of a heat-sensing facial pit. The enigmatic “pitless pitviper,” Azemiops feae or Fea's Viper looks almost nothing like other vipers, with its elliptical head, enlarged head scales, and smooth dorsal scales. In fact, it is so unusual that at times it has been classified as an elapid or a colubrid instead, of which its enlarged head scales in particular are reminiscent. Morphological and molecular evidence point to an ancient relationship between Fea's viper and other old world vipers ("viperines"), which last shared a common ancestor over 56 million years ago. 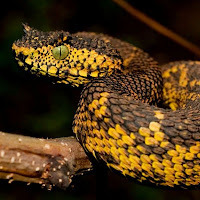 Rather, Fea's viper is more closely related to the crotaline vipers, or "pit vipers", a predominantly New World clade that includes rattlesnakes, copperheads, and bushmasters (although even from these it is distinct, having diverged over 32 million years ago). Although there are a few other Asian crotalines, such as Hypnale and Trimeresurus, even these are more closely related to their New World counterparts than they are to Fea's viper, all sharing an infrared-sensitive facial pit. Indeed, Azemiops occupies a lonely branch of the snake family tree. We know a little of the natural history of Fea's viper. It is found primarily in karst systems in the tropical uplands of northern Burma, northern Vietnam, and south-central China. Adults are active predominantly during cool, rainy summer nights, when they move slowly through deep leaf-litter in bamboo and tree fern thickets interspersed with well-lit clearings. They spend much of their lives in the holes and crevices of karst outcrops and in open and underground streams. Juveniles are most active on cool, wet fall nights. Like other vipers, Fea's viper hibernates in winter, so presumably they are fairly predictable in space and time when entering and leaving their hibernacula. Only a few prey items have been recorded, all of which have been rodents and shrews abundant in karst outcrops associated with swift mountain streams, although these snakes will also eat geckos in captivity. causing some to call them "White-headed Vipers". Fea's vipers are rare and difficult to keep in captivity. In 1986, the price list for Scales & Tails Trading Company in Hong Kong offered five Azemiops feae as "White Head Vipers" for $300 a piece, the most expensive item on the list. 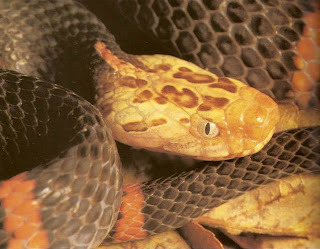 Observations of captive individuals indicate that these snakes do not tolerate dry conditions, and develop skin problems when maintained at less than 100% humidity. Ideal temperatures are between 60 and 68°F, surprisingly cool for a reptile (but a little warmer than those preferred by Rubber Boas). In the words of one reptile keeper, they are "so boring & difficult to keep" that he sent his off to a zoo. If widely held, this sentiment may actually bode well for Fea's vipers if it renders them unlikely to become overcollected for the pet trade, especially if the low demand can be met by captive breeding. Mating behavior involves courtship of females by males and is similar to that of other vipers in most respects. Fea's vipers lay small clutches of eggs, a characteristic they share with most viperines but not their closer relatives, the crotalines. How dangerous are Fea's vipers? Few bites have been reported, but these are described as "mild", causing few serious consequences. 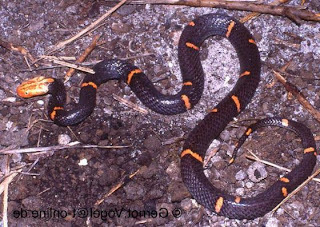 There are similarities between Fea's viper venom and that of viperines, especially Wagler's Temple Viper, except that Azemiops venom has no blood clotting, hemorrhagic, or muscle-destroying activity. The venom gland itself is similar to a viperine's, but Fea's viper fangs possess a ridge at the tip and a blade on the back seen only in some opisthoglyphous and atractaspid snakes. One venom component, dubbed azemiopsin, has been identified as a potential model in neurotransmitter research, adding to the pharmacopoeia of medicinally-useful compounds found in snake venom. Although discovered 125 years ago, Fea's viper has much still to teach us about evolution, neurology, and much else. Let us hope we can learn from it. Thanks to Gernot Vogel, David Nixon, and Michael and Patricia Fogden for use of their photographs.